Regardless of the outcome of the meeting on 30 November, the future of OPEC looks uncertain. 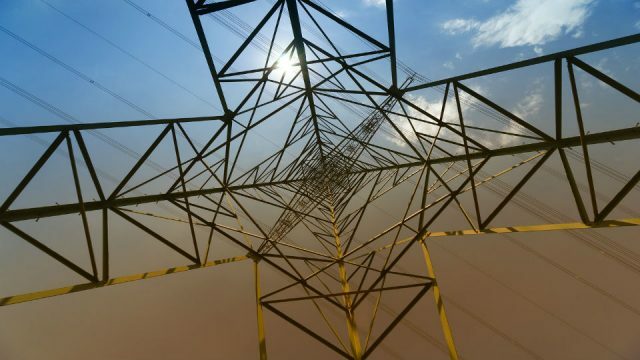 The organisation is facing a perfect storm, squeezed as it is between the revolution in shale oil, which has increased global supply and brought down prices, and the prospect of a global peak demand stemming from climate policies and falling costs of alternatives. Some have even declared the death of OPEC, but according to Thijs Van de Graaf, professor at the Ghent Institute for International Studies, this is premature. He believes it is more likely that OPEC will evolve from an output-setting cartel into an information clearing house. In fact, he writes, OPEC was never a cartel to begin with – and certainly never a powerful one. OPEC is facing some of the most severe threats in its 56-year history. The ‘fracking revolution’ has unlocked large swaths of new oil and gas supplies, contributing to a global glut. Alternative energy technologies are seeing impressive falls in costs—with solar photovoltaics prices dropping more than 60 percent between 2009 and 2016. A new climate treaty was adopted by 195 nations in December 2015, aiming to limit climate change to ‘well below’ 2 degrees Celsius, which would render the bulk of fossil fuel reserves ‘unburnable’. On top of that, the dramatic fall in oil prices since mid-2014, after a four-year period of relatively stable and high prices, has exposed the economic fragility of many OPEC countries who are heavily reliant on revenues from the foreign sales of crude oil, most notably Venezuela, which saw its economy shrink by 5.7% in 2015. The self-proclaimed cartel has failed to adopt a coherent, united stance in response to these challenges. At a dramatic meeting in November 2014, OPEC opted to let market forces play out. 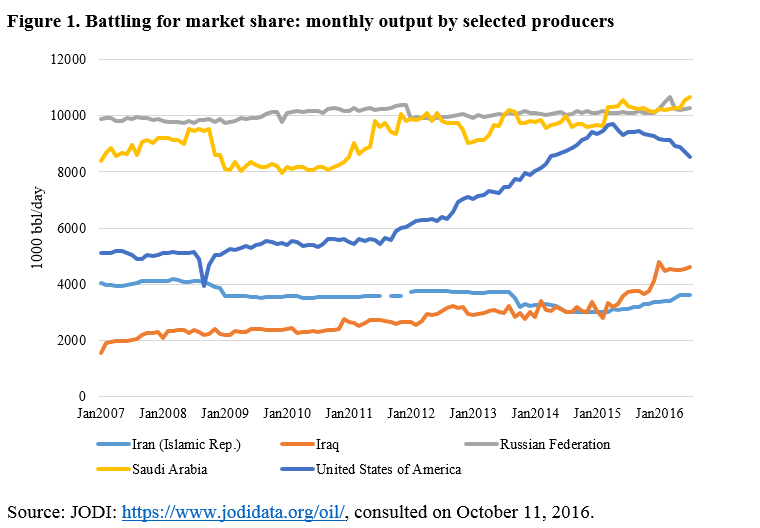 The inability of OPEC to agree to production cuts triggered a battle for market share, both inside and outside the cartel (see Figure 1). An attempt to forge a ‘production freeze’ (not to be conflated with a production cut) between OPEC countries and Russia at a meeting in Doha in April 2016 utterly failed. The talks collapsed at the 11th hour after Saudi Arabia refused to sign a deal without Iran, which in turn did not want to participate in a production freeze, arguing it needed to recapture market share lost while it was under international sanctions. Another attempt in September 2016 seemed more successful, with OPEC countries agreeing to adopt a production target ‘ranging between 32.5 and 33.0 mb/d’. On 30 November, the OPEC members will make a formal decision on this plan. But even if OPEC may reassert itself at this meeting, questions remain, in particular whether (i) OPEC countries will actually follow through on this commitment; and (ii) whether such a production cut could have major knock-on effects on global prices, in light of the large inventory overhang that needs to be cleared first. What is more, the battle for market share is only half the story. With its vast and cheap oil reserves, Saudi Arabia has long been wary of ‘demand destruction’ and wants to keep oil consumers hooked to oil, as was illustrated in a US Department of State cable that was made public by Wikileaks. ‘Saudi officials are very concerned that a climate change treaty would significantly reduce their income,’ James Smith, the U.S. ambassador to Riyadh, wrote in a 2010 memo to U.S. Energy Secretary Steven Chu. ‘Effectively, peak oil arguments have been replaced by peak demand.’ It thus seems reasonable to assume that for Saudi officials, low oil prices also serve as a hedge against a rising tide of fuel economy, biofuels, electric vehicles, natural gas vehicles, advances in energy storage, et cetera. Certainly it’s difficult to deny that OPEC does indeed face a dramatically altered external environment, brought about by three main trends: the fracking revolution and the risk of prolonged low oil prices, tightening climate policies, and cheaper alternatives to oil. The conventional view of energy geopolitics has long been underpinned by the expectation that global demand for oil will continue to grow unabatedly. The geopolitics of energy was then framed as a struggle for access to scarce oil and gas reserves—a dominant image that is still often reproduced in the media. That common wisdom has now changed. The new geopolitics of energy is characterised by abundance rather than scarcity, even at low prices. In fact, OPEC countries might not be able to burn through all their fossil fuel reserves due to climate change regulation, leaving them with stranded assets. Key trends in efficiency, fuel-switching and market saturation are pointing into the direction of a demand peak for oil instead of a supply peak. Oil producers are coming to realise that oil in the ground is not like ‘money in the bank’ but that these resources might someday be less valuable than oil produced and sold in the short term. The first crack in this conventional view of energy geopolitics arose due to the recent shale and fracking revolution, which has unlocked large new oil and gas deposits for commercial extraction. To be sure, tight oil and shale gas production comes at a price compared to conventional extraction, both in terms of higher exploration and production cost, a lower energy return on investment (EROI), and grave environmental and social risks. These costs and externalities, though, have not prevented the rapid and vast boom of the shale gas and tight oil industry in the United States, which alone added almost 4 mb/d of oil to the world’s oil production between 2007 and 2015 (see Figure 1). The IEA expects a number of countries to follow into the footsteps of the United States, with China likely in the vanguard, though it will take a few more years before their efforts to tap shale gas and tight oil deposits at a large scale will bear fruit. There are other emerging sources of supply, next to shale oil, including biofuels, oil sands, deepwater deposits, and growing conventional production from countries like Iraq, which might substantially increase the global reserve base. Coupled with OPEC’s rising internal demand and stagnant or even falling upstream capacity, the group’s share of the export market might be eroded over time. But the advent of the shale and tight oil industry stands out for three reasons. First, by unlocking vast resources that had long been deemed uneconomical, the fracking technology has dispelled ‘peak oil’ worries just as rising climate concerns have begun to cast doubt on the long-term outlook for oil demand growth. This has fueled speculation that a huge ‘carbon bubble’ is in the making, that large amounts of oil would have to ‘stay in the ground’, and that some of OPEC’s resources might end up being ‘stranded assets’. This might change the revenue-maximising strategy of low-cost producers like Saudi Arabia and give them an incentive to speed up, rather than slow down, oil extraction. Second, the shale revolution accelerates the eastward migration of the global oil market, whereby the center of gravity of oil consumption, and hence oil trade flows, are decidedly shifting to the so-called ‘East of Suez’ region. That leaves oil exporters competing with each other for an increasingly concentrated Asian market, which is itself dominated by supergiant Chinese oil trading companies with considerable market power. This situation provides another deterrent for OPEC to implement production cuts. Last but not least, what stands at the center of the shale oil revolution is that it has changed the cost curve and elasticity of oil supply. The fracking industry operates on a much shorter investment cycle than the conventional oil industry: upfront costs are relatively low, decline rates are steep, lead times and payback times are short. There is no real exploration process to speak of because the location and broad characteristics of the main plays are well known. The time from an investment decision to actual production is measured in months, rather than years, making the tight oil industry far more nimble and responsive to price signals. On the demand side, the Paris Agreement concluded in December 2015 might prove to be a game-changer. 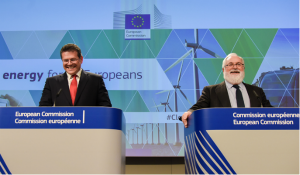 Even though the text of the Agreement nowhere mentions the words ‘oil’, ‘gas’, ‘energy’, ‘fossil fuels’ or even ‘carbon’, the deal effectively implies a complete overhaul of the world’s energy mix. By agreeing on the political goal of limiting the average global surface temperature increase to ‘well below’ 2°C above preindustrial levels and even try to keep it below 1.5°C, the Paris Agreement boils down to a commitment to phase out fossil fuels before the end of the century. Under a scenario where fossil fuel use is reduced to limit global warming to 2°C, oil will probably be phased out slower than coal which is far more polluting and has more substitutes. Yet, oil will certainly not be able to expand at the same rate as it used to. 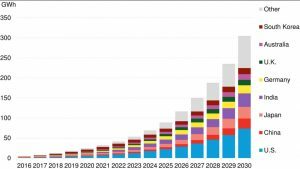 The IEA’s latest 450 scenario, which is consistent with a 50% chance of less than 2 °C of global warming, projects global oil demand to reach a peak of 93.7 million b/d in 2020 but thereafter fall to 74.1 million b/d by 2040. This would imply that the oil industry’s decades-old expansion would come to a halt, and enter a permanent decline, implying that oil would become an ex-growth sector. 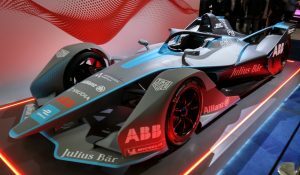 This could trigger a ‘race to sell oil’ among petrostates. McGlade and Ekins have calculated that, globally, a third of oil reserves, half of gas reserves and over 80% of current coal reserves should remain unused from 2010 to 2050 in order to have a better-than-even chance of meeting the target of 2 °C. These ‘unburnable reserves’ do not decrease very much in a scenario with widespread deployment of carbon capture and storage (CCS). For example, the amount of ‘unburnable’ oil inches slightly downwards from 35% to 33% of all reserves if CCS is widely deployed. 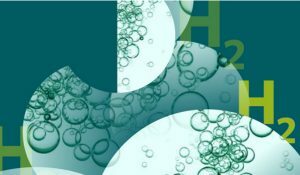 The modest effect of CCS is due to the fact that CCS will take decades to scale up globally, the technique might not be more cost-effective than renewables or nuclear and it is not entirely carbon-free. 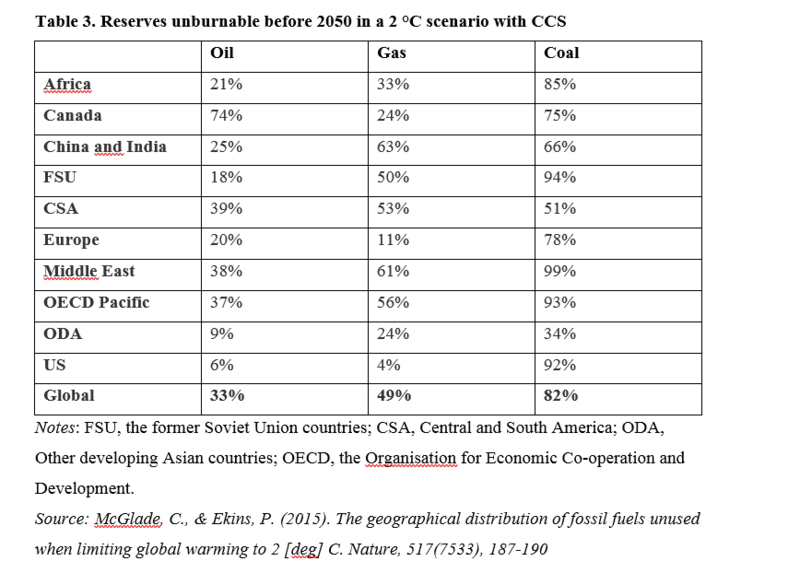 Table 3 depicts the shares of fossil fuel reserves that should be kept under the ground to have a medium chance of limiting warming to 2 °C in a scenario with CCS deployment. Admittedly, there are good reasons to be skeptical about the actual results of COP21. However, even if the 2 °C goal is not met, there are significant drivers that could lead to a peak in global oil demand, including lower economic growth (especially in emerging markets), the falling cost of renewables and electricity storage, the emergence of prosumers with a keen interest in electric vehicles, the spread of more stringent policies to mitigate air pollution or water stress, and the growing decoupling between oil consumption and economic growth due to greater efficiency. In short, the writing is on the wall that oil will never again grow at its historic rates. 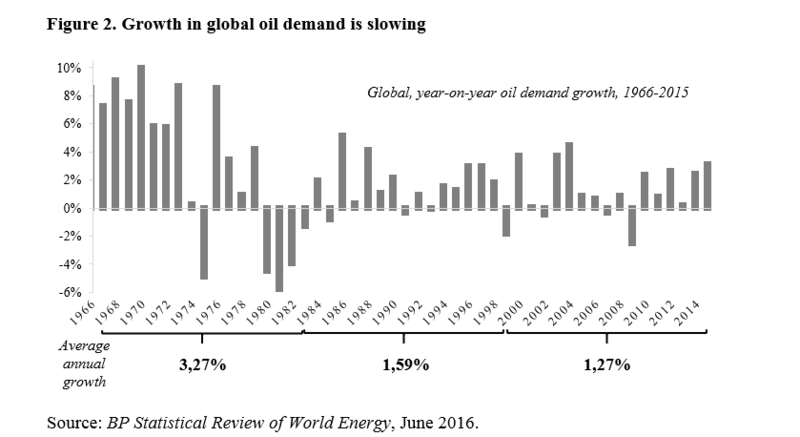 As Figure 2 shows, in only 9 of the past 50 years did the global demand for oil contract. In all other years it grew, quite often by more than 3% on an annual basis. Over the whole period (1966-2015), the compound annual average growth rate of oil demand was 1.94%. Throughout all of the IEA’s scenarios (2013-2040), this rate will slow down to 0.88% (Current Policies Scenario), 0.43% (New Policies Scenario), or even -0.85% (450 Scenario). Can OPEC cope with these challenges? In light of these challenges, observers have declared OPEC dead as a cartel. There are four major reasons why this view is misguided. First, OPEC never really was a cartel, let alone an omnipotent one. It only began to enact production targets since 1982, 22 years after it was founded, and even then it was not very successful. Despite OPEC’s efforts to function as a cartel, the oil price plummeted in the first half of the 1980s. Most, if not all OPEC countries cheated on their allocated production targets until Saudi Arabia’s patience was exhausted and the Kingdom decided to flood the market in 1986, in order to regain market share and punish the cheaters. Colgan (2014) finds that the cartel has overproduced a staggering 96 percent of the time in the period 1982-2009. Second, OPEC’s reserves are not stranded yet. OPEC still commands the largest conventional oil reserves. Especially the Gulf members of OPEC have very low production costs. If oil is stranded due to climate policies, it will most likely be the most expensive, risky and polluting fields, such as the Arctic, the ultra-deepwater fields, and the tar sands. Cherp et al. (2013) find that a peak in oil demand due to climate policies could even lead to a higher concentration of production in the hands of those states holding the largest conventional oil reserves, which are generally cheaper and less carbon-intensive. Third, OPEC has demonstrated a remarkable flexibility and resilience during its lifetime. The organisation has survived various price crashes, as well as the emergence of the North Sea in the 1970s, Alaska in the 1980s, offshore oil production in the 1990s and biofuels in the 2000s—all of which were seen as existential threats. Crucially, OPEC even hung together when the Saudis inflicted a lot of pain on their fellow cartel members in the late 1980s. In this flexibility also lies the key to understand why OPEC is the only commodity organisation to have survived, whereas earlier commodity agreements (including for tin, coffee, and natural rubber) have faltered and disappeared. OPEC does not have a legal clause on how to intervene in specific market conditions, thus allowing it to respond flexibly to changing circumstances. Finally, OPEC will not wither away quickly because it still proves useful for its member countries, as is most vividly illustrated by the recent re-entries of Indonesia and Gabon to the club. The re-entry of Indonesia is most remarkable since the country has become a net importer. Yet, for its members, OPEC is useful as a forum to share information, as a forum for deliberation, and most notably, a source of prestige. There is a persistent rational myth that OPEC is a powerful cartel. International media are obsessed with OPEC meetings, outcomes and declarations, even if the group’s (long-term) impact on oil prices is heavily disputed. But what these reports are missing is that its output-setting function is not the primary reason for OPEC’s existence. OPEC is just as much a high-level, influential international organisation of oil exporters. There are many examples of international organisations that have outlived their original mandate. Think of NATO’s resilience after the end of the Cold War, the World Bank’s endurance after the postwar reconstruction of Europe, or the Bank for International Settlements surviving the Great Depression and the Second World War. In the same vein, it is conceivable that OPEC survives the transition to a post-carbon society, as long as it finds a niche for itself that proves valuable to its member states. Other international energy organisations such as the IEA have been busy for years to adapt to major shifts in the global energy landscape. The IEA has been quite successful in this regard, and is touted as a model for the reform of other global institutions. Yet, other international energy bodies have been much slower to adapt and some even stick around without being very meaningful. 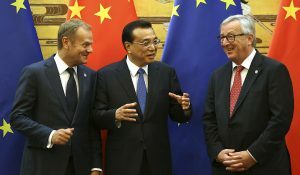 A case in point is the Energy Charter Treaty, which has been in complete disarray since Russia’s formal withdrawal in 2009, despite recent attempts to reinvigorate the organisation. The key question thus becomes whether OPEC countries will engage in a far-reaching examination of the organisation’s mission and toolbox, or whether the club will sink into oblivion. A systematic account of the history of global energy governance has shown that oil exporters might engage in institutional innovation when they are dissatisfied with the level of their oil revenues. The current low oil prices might thus provide a window of opportunity to reform OPEC. Over the short to medium term, OPEC might continue to serve as a forum to facilitate attempts at managing oil supply. For all the doubts expressed about it, the recent Algiers signals that there still exists a willingness to intervene and stabilise oil markets in spite of the rhetoric that the oil market should now manage itself. Toward the longer term, as the world shifts away to cleaner fuels, OPEC could provide a valuable framework for exchanging critical information among member states about the implications of this shift. This could be technical cooperation on technologies such as CCS, which may play their role in the transition and prove to be another source of income for OPEC countries out of their depleted oil and gas wells. But it could also entail the sharing of best practices of how to make a national economy less dependent on the revenues from the foreign sales of crude. Despite many attempts to diversify petro-economies, there are only scant examples of success (e.g., Indonesia, Malaysia and Dubai), and it can be questioned whether these models can be replicated. OPEC’s Secretariat could become an information clearing-house to share information on what works and what does not in particular circumstances. Thijs Van de Graaf [thijs.vandegraaf@ugent.be] is an Assistant Professor of International Politics at the Ghent Institute for International Studies, Ghent University. His research focus is on global energy governance and energy policy. 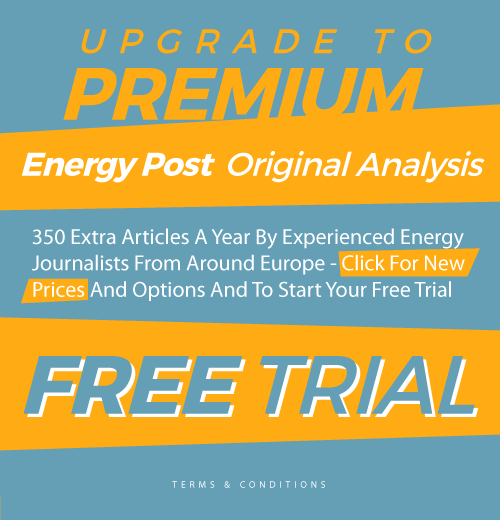 This article is an edited and shortened version of a fully annotated academic paper to be published in the journal Energy Research and Social Science.